A smart way of making Motichoor Ladoo without using the special ladle ! Sieve the flour, Mix 1 cup of water to the flour and using whisk whip to smooth shiny batter consistency (refer video). When you drop a spoonful of batter, it forms a mark and then slowly disappears/merges with remaining batter thats the right consistency. If needed add the reserved water and keep ready. Meanwhile heat enough ghee or oil in the pan/kadai. Try to keep the ladle as high as possible over hot oil and add the batter, tap soon the batter with the spatula you use. 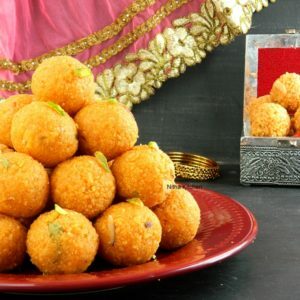 Don’t over load the pan, also for this ladoo, the boondis should pop and cook that’s it, don't wait to turn golden brown or crisp. Every time just give some time for the oil to regain its hot temperature say 30-45 seconds before starting with next batch. Once done with all the gram flour batter. Take 2 cups of sugar and 1/2 cup + 2 tbsp of water, boil in medium flame till all the sugar dissolves and changes color/clear syrup. Add cardamom powder , I usually grind it with sugar including its skin. When the sugar gets thick, say approx 4 to 5 minutes after it dissolved well in medium flame, check the consistency by taking a drop between your thumb and next finger (Pic 5). Slowly try to expand it should at least cross 1/2 string and up to 1 string. Now remove the syrup from flame, reserve 1/4 cup and add the fried boondi to this hot syrup. Leave it aside for 1 hour and with on/off stirring for every 15 minutes once. During each stir if the boondi need some syrup you can add tbsp of reserved syrup by this time. Also after an hour if you have too much syrup, filter it. Also you can either grind the soaked boondi or make ladoo as it is (as shown below). Now add the ghee fried nuts to it or toast the nuts (i did so) and add to it. Mix all evenly and press the mixture well with your fist to hold round balls (refer video). Repeat the same till finish with all soaked boondi and this can be in room temperature for almost a month, if handled properly. The sugar in this ladoos are moderate, you can increase another 1/2 cup sugar if you wish. The syrup can by from 1/2 to 1 string consistency. For the reduced sugar version, no need to check sugar string consistency but once done do refrigerate the ladoos, their shelf life is less.